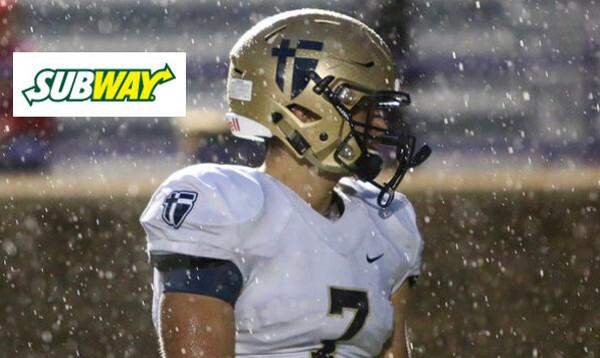 On the Week 9 edition of the Subway Friday Fresh Take, we’ll recap some of the state’s top games and highlight a few other notes from Thursday and Friday’s action. Wichita Northwest beat Hutchinson 28-21 on Friday night to win the District 8 title and advance to the 6A playoffs as the No. 1 seed. On a night where the typically potent Grizzly rushing attack was held in check, Northwest used three big passing plays to help top the Salthawks. Senior quarterback Kevin Folsom tossed touchdown passes of 79 and 77 yards to Martese Mullins, and a 36-yard screen to Jahlyl Rounds to account for Northwest’s first three scores. Those three big plays accounted for approximately 57 percent of the Grizzlies total offense in the game, and helped Northwest go to halftime leading 21-14. Ruben Benitez scored his second touchdown of the game to bring Hutchinson even at 21 late in the third quarter. But less than a minute later, Northwest regained the lead on an 8-yard touchdown run by Alex Bott to complete the scoring. Folsom passed for 257 yards and those three touchdown passes. Mullins caught three passes for 163 yards and the two scores, while Rounds caught three for 44 and rushed for 34 yards. Northwest only managed 81 yards rushing on 35 carries after entering this game averaging 373 yards rushing per game. Benitez rushed for 105 yards and two scores for Hutchinson, while quarterback Canyon Maldonado added 109 yards rushing and threw a touchdown pass. Despite the loss, Hutchinson advances to the state playoffs thanks to Dodge City’s 21-20 upset of rival Garden City in the other half of District 8. Garden City (7-2) needed to win in order to make the playoffs and the Buffs scored with just over a minute remaining to seemingly send the game with rival Dodge City into overtime. But Dodge City blocked the extra point and handed their rivals a bitter, season-ending defeat to the reclaim the Hatchet for the first time since 2012. With the game tied in the third quarter, Red Demon quarterback Caden Walters hit Eric Reid on a short touchdown pass to retake the lead, 21-14. The win also gives Dodge City the outright Western Athletic Conference title at 4-0. The Red Demons finish the season 5-4 with all four losses coming to playoff teams. Third-ranked St. Thomas Aquinas won the 5A, District 4 championship with a dominating 35-3 win on at No. 4 Pittsburg. A steady rain and windy conditions played havoc on the Saints and Purple Dragons as far as ball security. Both teams lost several fumbles, but it was Aquinas that took advantage of the short field following Pittsburg fumbles by cashing in with touchdowns. James Cosentino fumbled on the game’s first play from scrimmage which led to a 38-yard field goal by Pittsburg Nathan Neef. Cosentino would quickly rebound leading the way on an impressive drive that ended with his 24-yard touchdown run. The senior finished with 120 rushing yards on 26 attempts. Aquinas led 14-3 at the half, and pulled away in the third quarter. Quarterback Karter Odermann rushed for four touchdowns for the Saints. The two teams combined for a total of seven pass attempts. Lawrence Free State used a strong defensive performance to hand Topeka High its first loss of the season, 21-0. The Firebirds held Topeka’s high-powered offense to just 174 yards of total offense, more than 300 yards below their season average. Meanwhile, Free State grinded out 375 rushing yards behind Sam Skwarlo’s 166 yards. His first-quarter touchdown accounted for all of the scoring in the first half. Quarterback Bryce Torneden added a pair of touchdown runs in the second half, including one with a minute remaining in the game. He finished with 147 yards rushing on 19 attempts. Buhler topped Abilene 21-7 to completed an undefeated regular season and win the 4A-I, District 8 championship. Senior Dillon Engelland rushed for more than 260 yards and scored all three Crusader touchdowns in the win. Abilene finally got on the board in the third quarter on a Harley Hazlett touchdown run to pull within the final 14-point margin. The Cowboys (8-1) advance to the playoffs as the district runner-up, but will have to travel to Ulysses in the first round next week. Buhler will host Mulvane (5-4) in the first round of the playoffs. The Crusaders narrowly beat the Wildcats, 20-14, back in Week 2. Paola went on the road and captured the 4A-I, District 4 championship with a 28-7 win in the rain over Fort Scott. Dalton Rankin scored twice in the third quarter to put the Tigers in an insurmountable hole. Rankin returned a Fort Scott fumble 11 yards for a touchdown early in the third quarter to build upon Paola’s 14-0 halftime lead. Rankin later added a 12-yard touchdown run mid-way through the third quarter to put Paola up 28-0. Quarterback Ryan Gleghorn and Nathan Staats each scored touchdowns for Paola in the first half. Staats rushed for a game-high 145 yards, while Gleg horn added 95 yards on the ground. Paola did not complete a pass attempt in the game. Fort Scott’s Kaleb DeLaTorre passed for 106 yards including a 35-yard touchdown to De’Vonte Robinson in the fourth quarter. Marion held off Mission Valley 22-20 on Friday night, but ultimately fell short of a playoff berth in Class 2-1A. Marion’s Aaron Riggs snapped off a 52-yard touchdown run in the third quarter to give the Warriors a 22-14 lead. Mission Valley responded with a 21-yard scoring run from Clay Phillips, but the two-point conversion failed leaving the Vikings down 22-20. Mission Valley would never seriously threaten to score again. The Vikings came up short on two-point conversion attempts on two of their three touchdowns, while Marion converted two of three. Despite the loss, Mission Valley finished as the District 3 champion based on the district points tie-breaker, while Northern Heights earned the runner-up. Marion entered the game needing at least a 19-point win over Mission Valley in order to secure a playoff spot. The Warrior offense struck early on a touchdown pass from Jack Schneider to Mason Pedersen and later added a Corbin Wheeler touchdown run to lead 16-8. Mission Valley pulled to within 16-14 at halftime on a touchdown pass as the clock expired. Mission Valley (7-2) will host Lyndon (7-2) in the first round of the playoffs next week, while Marion ends its season at 7-2. Tucker Horak etched his name into the history of the “War on 24” rivalry with a performance to remember. The Rossville senior quarterback rushed for 384 yards and seven touchdowns as his team broke open a close game at halftime to beat Silver Lake, 56-35. Horak also passed for 134 yards; including a touchdown pass to Jacob Bradshaw just before halftime that gave the Bulldawgs a 21-17 lead at the intermission. Rossville and Silver Lake began the second half by trading a pair of touchdowns. Hunter Howerton pulled the Eagles within 35-29 in the third quarter before Horak broke consecutive touchdown runs of 75, 76, and 43 yards. Dalton Dultmeier kept Silver Lake close with a 300-yard passing night that including four touchdowns. Keenan Baird had 121 receiving yards and three touchdown catches for the Eagles. Dawson Hammes added 100 yards on the ground for Rossville. Victoria broke a 22-22 tie with Otis-Bison by scoring the next 46 points in a 68-22 win in the fan’s choice for Kpreps Statewide Game of the Week. The Knights got started right way as Collin Kisner returned the game’s opening kickoff for a touchdown. The two Central Prairie League rivals traded touchdowns including a kickoff return for a touchdown by Otis-Bison’s Brad Lightfoot. Cougar quarterback Kade Urban hit Hayden Maier on a touchdown pass to tie the game at 22. Victoria’s barrage of points began with a Joe Dortland 60-yard touchdown run. He would then hit Taylor Corley on a touchdown pass for a 34-22 lead in the second quarter. Before halftime, Dortland passed laterally to Brady Dinkel who then hit Corley on a touchdown pass for a 40-22 lead at the break. It was Dinkel’s first game back since suffering serious internal injuries in the Knights’ Week 1 win over Central Plains. Dortland has been playing quarterback in Dinkel’s absence. Parker Riedel scored twice in the third quarter and Corley and Lane Kisner each returned fumbles for touchdowns to complete the scoring. Phillipsburg scored a pair of fourth-quarter touchdowns to pick up a key road-win, 14-7, at Smith Center. The Redmen and Panthers remained scoreless for much of the game before Smith Center’s Cale Rogers broke a 72-yard touchdown run on a fourth down plan. Kirk Coomes scored for Phillipsburg and the Panthers added the two-point conversion for an 8-7 lead with about five minutes remaining in the fourth quarter. After a defensive stop, Coomes scored again for the Panthers to push the lead to 14-7.